A function pass for msan instrumentation. Instruments functions to detect unitialized reads. This function pass inserts calls to runtime library functions. If the functions aren't declared yet, the pass inserts the declarations. Otherwise the existing globals are used. Definition at line 40 of file MemorySanitizer.h. Definition at line 41 of file MemorySanitizer.h. 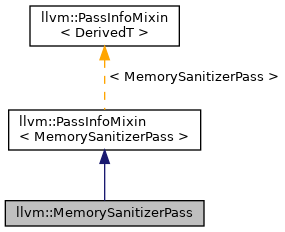 Definition at line 620 of file MemorySanitizer.cpp. References llvm::PreservedAnalyses::all(), llvm::GlobalValue::getParent(), llvm::AnalysisManager< IRUnitT, ExtraArgTs >::getResult(), INITIALIZE_PASS_BEGIN(), INITIALIZE_PASS_DEPENDENCY, and llvm::PreservedAnalyses::none().